some wilderness would like to see that lava. 1. Panorama stitched from top of the Crater, near the beginning of the ride. Really quite spectacular in real-life. 2. Typical trail for first part of the ride, although there was a killer downhill near the start. 3. My group in front of a Temple in the inner caldera. 4. Throwing up the W's in the inner caldera. 5. Pano of view in inner caldera. Really quite spectacular. Ramang is on the right. 6. 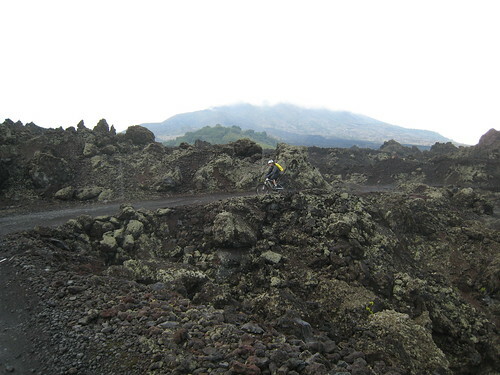 Riding through the lava fields, near the end of the ride. Lots of vid but haven't had time to edit it and very late. Will try and put it up later. First bit of the video with the green bits looks a lot like the first bit of my ride. Good, flowing singletrack with a bit of strenuous climbing. Volcano bit they went to was different, ours had totally cooled, probably as we didn't go right to the centre, but stayed in the outer caldera. All black lava rock though. Have a few pics/videos and will try put them up later tonight after work. 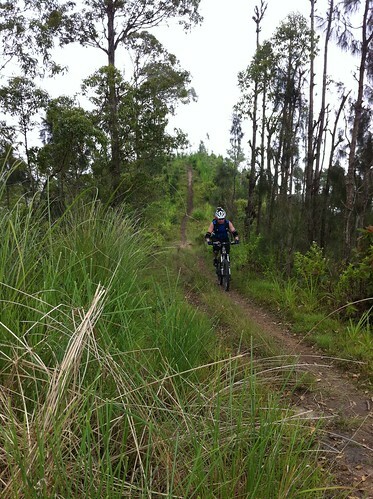 Pinkbike called it Indonesia thats why. Yeah DIY needs time - good advice. Would appreciate some pics if poss. Last edit: 7 years 1 month ago by roger. 1. A guide is probably a good idea, given that taxis/directions do not seem to be exactly readily available in the parts of Bali where the good MTBing is. It's also not exactly that small as an island. For example, it's 2.5 hours from the South to the volcano by car. The ride I did was about 31km, and while there were some shops on the way where you could buy some food/drinks, I'm not sure how you would necessarily find your way around. I suppose you could do it with a Garmin Edge 800 or something similar, or with tips from the owner of The Bike Shop. 2. Yes, it's possible to hire a van/bus to travel around. When I was there, my friend (who is Indonesian) was able to book a private van for 10 hours for around 200K-300K rupiah. However that may be because he is a local, and he also booked quite a while in advance. In the evening the driver wanted 300K to take us back to our hotel (a 2 hour drive) from the dinner venue, most likely because it was an ad hoc booking. An official taxi which is a van is much pricier, say around 35K rupiah for the 15 minute ride which I took from the hotel to The Bike Shop with the bike in the back. Frankly, I think you might as well go for the tour since for only around 700-800K all-in it includes a. Transfer price to and from hotel for the tour b. Good support including excellent food (best I had on the trip), water, Pocari, etc. which you will need, as the trails do require at least moderate fitness c. Guaranteed good scenery, trails, riding and information about local attractions etc. d. An excellent and friendly guide who provides you with item c. e. Peace of mind and efficient use of time as you are on holiday. However, if you have more time and/or if you really want to DIY I think you can speak to Andreas (I think he's from Holland) who owns The Bike Shop - he will have some ideas on riding and I remember him saying there are actually some good trails in the South as well. Maybe email him and see what he says: info AT thebikeshopbali DOT com (you know what to do). Interesting right up on Bali and it was on Pinkbike last week. 1. Do you need a guide? on a smallish island ... I dont mind getting lost once in awhile. If you know what I mean. 2. Is it possible/cheap/pricey to hop on any van/bus to get a lift up the Mountain. I am a DIY enthusiast. 3. name of bike shop. Went to Bali a bit over a month ago. Booked a 1-day MTB ride with Bali Trailblazers but they ended up subcontracting it to Bali Riders www.bali-rides.com/ , which is run by Ramang, one of their ex-guides. We did the Mt.Batur Crater Rim to Batur Lake. It was a good run, with some pretty great and fast downhill at the start after some very rough tarmac. Highly recommended as you really get a sense of the volcano's size and so on. The description on their website is very accurate. Ramang is also very friendly and knowledgeable. Really, all parts of the ride are great, but the lava ride really probably wasn't something you can get in many places, even if it wasn't the most technical ride. I was riding with a bunch of experienced Singaporean MTBers who usually ride in Malaysia (Langkawi - they entered the MTB race there in October, like Ramang - and Cameron Highlands), Chiang Mai, and Singapore. They had done another, trickier ride (apparently due to there being lots of mud) the day before with Bali Rides, and said that the ride I was on was much more fun. They all genuinely seemed to have a good time. This was my first MTB experience abroad, I usually just do the Tai Lam Chung loop and have done the Lantau waterworks route before one-way. 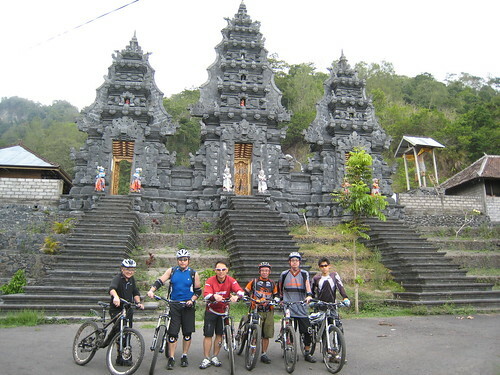 You can use Bali Rides' bikes, being Trek 6000-series bikes, but we all brought our own (mostly FS, I even brought my own helmet). My Remedy 7 handled everything like a real champ. Shin and elbow protection definitely a bonus, although I was lucky enough not to fall. Lunch was an incredible suckling pig - best I've ever had (including Chinese-style suckling pig!) and rice, but there are of course other options as they do ask you before the ride. For support, I'm not mechanically gifted, so I moved my bike over in an EVOC Bike Bag after getting Sky Blue to tear it down for me, then I got The Bike Shop in Bali to put it back together - it's a serious shop with serious kit run by guys who know what they are doing, and they have a good range of stuff. They charge about US$9-10 to put my bike back together, then I rode it to our resort. They are quite far south though (see below as to why this issue may arises). 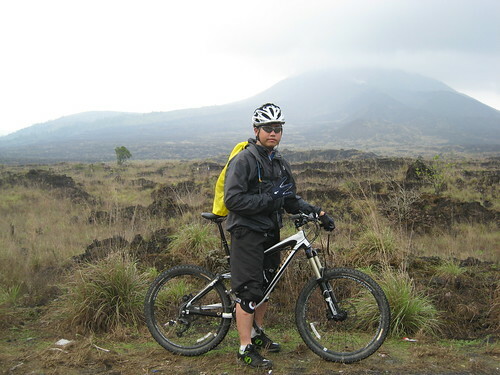 - It's better to stay further north (near Ubud, so away from Jimbaran/Nusa Dua/Kuta) if you can on the day(s) you're going MTBing, rather than south, else you'll be facing a 2-2.5 hour ride from your hotel. This may be different for multi-day rides. - Bring a waterproof as it does rain. Also, it is not exactly sunny-beach-type Bali that most people think of at the start, although it was around 20-28 deg Celsius.